Britannia is not a new name for P&O. The previous ship of that title was one of the outstanding vessels of its time, tiny by today’s standards (6,000 tons) but good enough to take the young Winston Churchill to India in 1888. It is well known that Her Majesty was not amused when Tony Blair decommissioned the former Royal Yacht, but judging by her demeanour at the naming ceremony that was all behind her. Prince Philip also was in great form. He clearly loves the opportunity to be involved with the sea. 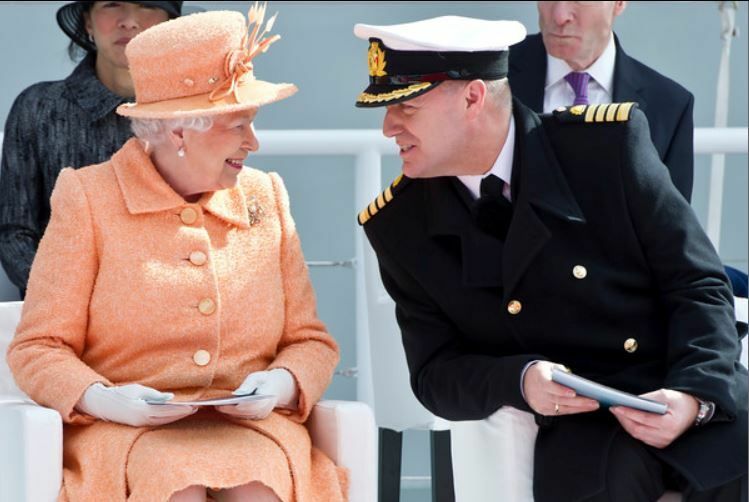 Last year he was the Guest of Honour at a ceremony to celebrate 10 years of Queen Mary 2. Also on hand was Carnival Chairman Micky Arison, seemingly a regular at these Royal occasions. The naming ceremony was a very well organised event in the best British tradition with actor/comedian Rob Brydon presiding (he also hosted an ‘on board’ cocktail party the previous night) with the bands of the Royal Marines, the Irish Guards, The Red Hot Chilli Pipers and dancers from Strictly Come Dancing. The traditional vino was smashed, a Nebuchadnezzar (20 bottles) of English sparkling wine from the Wiston Estate Winery near Pulborough, Sussex. All in front of a 1,100-strong audience seated in a covered stand. The weather was wonderful and the atmosphere terrific. A world wide audience watched the ceremony, broadcast by most international news channels. For the record Britannia comes in at 141,000 tons, has 3,647 passengers (lower berths), 1,350 crew, 15 public decks, 13 bars, and 13 places to eat. 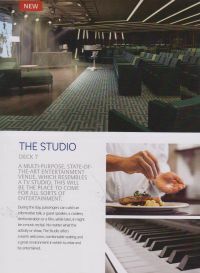 There are four pools, 1,837 cabins of which 1,313 have balconies including 15 single, and a further 12 single inside. The art collection is said to be worth well over £1m, including the ‘Spirit of Modern Britain’ two pieces specially commissioned by P&O. The extensive children's facilities include four age group areas, a night nursery and outdoor splash area for teens (and if Ventura is anything to go by very popular with a staff of 36 during the peak holiday periods). Free of charge are cooking classes for children. Adults can attend the Chefs Table, hosted by the line’s ‘Food Heroes’. But if you want to be taught by Marco Pierre White, James Martin or Atul Kochhar (to name but a few) they could be on your voyage. However that will cost. As will drinking with Ollie Smith. 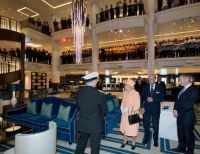 Britannia boosts P&O Cruises capacity by 24% and joins the small band of cruise liners that are over 1,000 feet long. It is the largest ship ever designed for the British holiday market. This summer she is based out of Southampton taking a series of trips from two nights (a quick excursion to Guernsey – maybe just to try out the ship’s tenders), to 15 days. There is an Atlantic crossing in late October followed by a sojourn in the Caribbean. She returns to the UK in March 2016.
Business Travel News spent an exciting 24 hours on the new ship, far too short a time to find one’s way around, but at least a taster. We never did get as far as the Oasis Spa and it was not the sort of day to try one of the swimming pools. On Britannia the casino is situated in Brodies bar on Tween deck, deck 6, but both that facility and the shops were closed. P&O produced what must be the ultimate press notepad, 100 pages in colour with just about everything you needed to know regarding the ship. The Headliners Theatre (890 seats) is both technically and from a viewing aspect better than anything in London’s West End, and if the short introductory programme is anything to go by, at least it is equal for entertainment. And it is free, or if you prefer, part of the holiday hospitality package. David Dingle, Chairman of Carnival UK, hosted a lively on-board press conference on the evening before the ceremony with a beaming Mickey Ariston in the audience. Anthem will be named later this month, also at Southampton. The ‘trade’ guest list will be similar but there will be two differences in the event. Clearly the Queen cannot name an American ship (Britannia is registered at Southampton) and instead of erecting a grandstand RCCL is taking its guests for a two-night trip in the English Channel. The long range weather forecast looks promising. BTN will report. River cruising is a completely different product to the deep sea variety and should be treated rather like a car expedition with someone else doing the driving, or a coach tour. The real big adjustment is that you don’t change your accommodation every night and at the most, certainly in Europe, you will be joining not more than around 200 people. Compared to the ocean-going liners the cabins are generally smaller and the catering, due to space considerations, more limited. Wi-fi is usually free and some boats even have small swimming pools. The atmosphere on board is very congenital with the cruise director often doubling up as the port lecturer, usually assisted by specialists at each town/city visited. The Danube and Rhine are the most popular rivers in Europe, St Petersburg to Moscow on the Volga fascinating and other waterways include the Douro (Portugal) and Rhone (France). Please note that we emailed all the river cruise companies known to us for their latest deals and updates. Only the above operators replied, a great pity but it does include some really fine river operators.